Let’s investigate the features and area of parallelograms. Figures A, B, and C are parallelograms. Figures D, E, and F are not parallelograms. the number of sides that a parallelogram has? opposite sides of a parallelogram? opposite angles of a parallelogram? Find the area of the parallelogram and explain your reasoning. Change the parallelogram by dragging the green points at its vertices. Find its area and explain your reasoning. If you used the polygons on the side, how were they helpful? 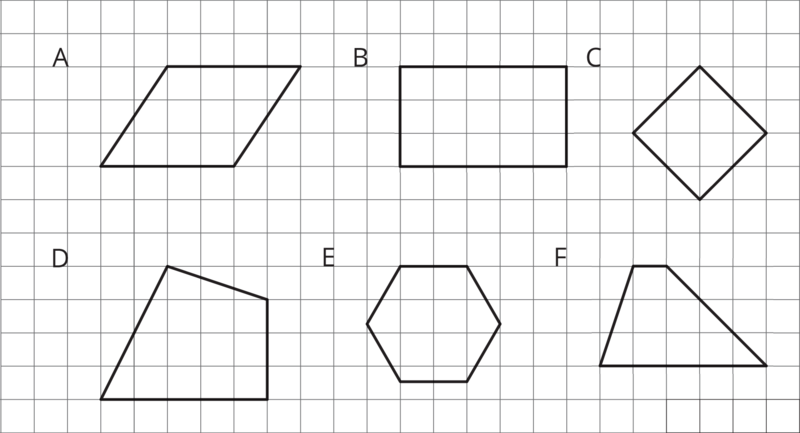 If you did not, could you use one or more of the polygons to show another way to find the area of the parallelogram? Find the area of the following parallelograms. Show your reasoning. 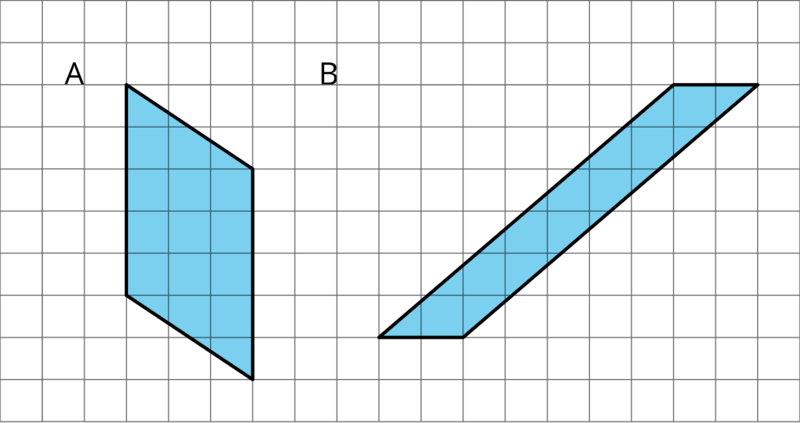 The opposite sides of a parallelogram have equal length. 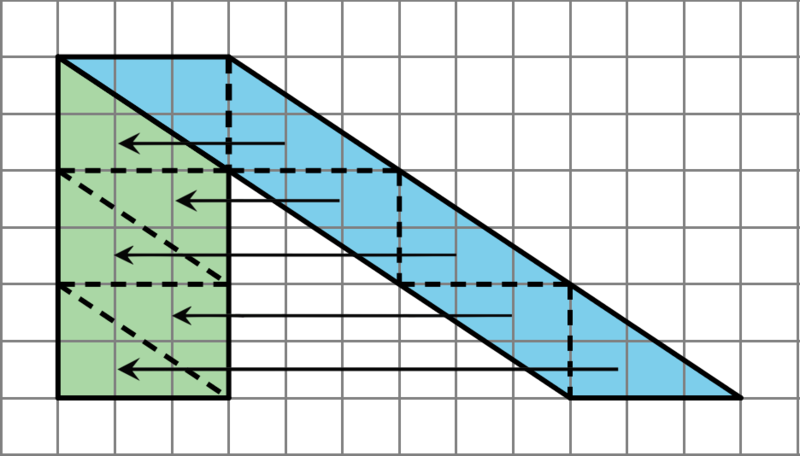 The opposite angles of a parallelogram have equal measure. There are several strategies for finding the area of a parallelogram. We can enclose the parallelogram and then subtract the area of the two triangles in the corner. Both of these ways will work for any parallelogram. 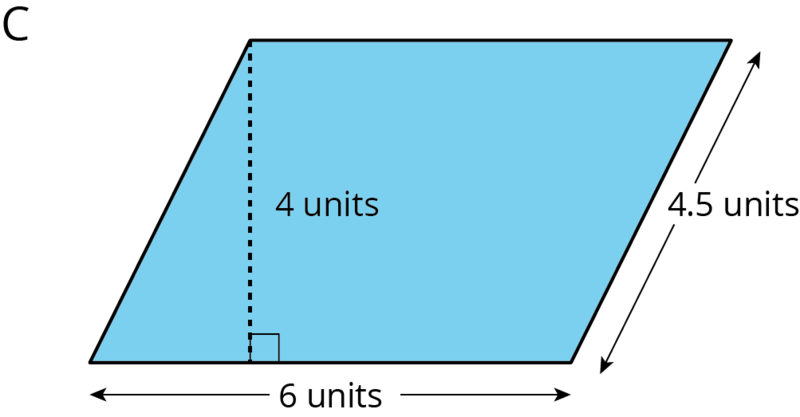 For some parallelograms, however, the process of decomposing and rearranging requires a lot more steps than if we enclose the parallelogram with a rectangle and subtract the combined area of the two triangles in the corners. Here is an example. A parallelogram is a four-sided polygon with two pairs of parallel sides.